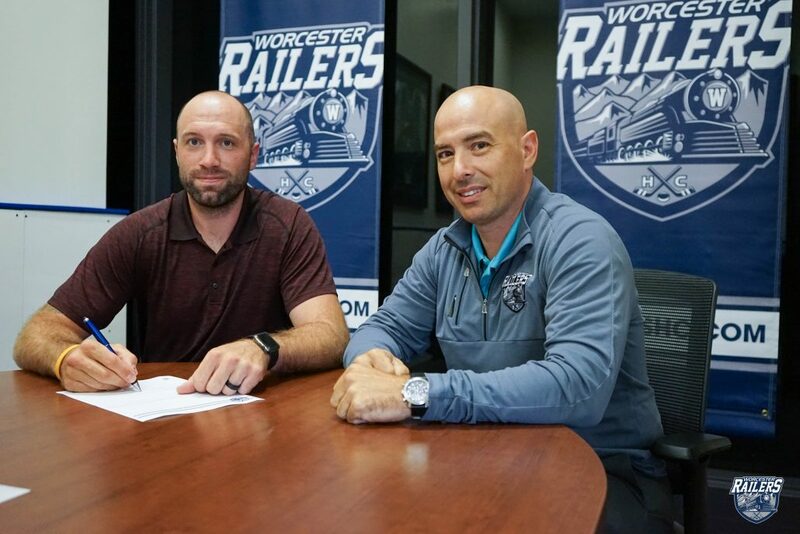 WORCESTER, MA – The Worcester Railers Hockey Club (@RailersHC), proud ECHL (@ECHL) affiliate of the New York Islanders (@NYIslanders), and Railers HC General Manager and Head Coach Jamie Russell officially announced today that the club has signed veteran right wing Ashton Rome to an ECHL contract for the 2017-18 season. The 6-foot-one, 210lb veteran right wing was a fan favorite in Worcester, skating in 128 games for the Worcester Sharks (2006-09), recording 15 goals, 11 assists, and 112 penalty minutes. Now entering his 12th professional season, Rome has played in 294 AHL games for Worcester, Toronto, Hershey, and Portland totaling 40 goals, 38 assists, and 245 penalty minutes. Rome was a member of the 2010 Hershey Bears Calder Cup championship team, where he recorded five points in 10 playoff games. He has also suited up in 132 ECHL games for Phoenix, Idaho, Greenville, and Manchester scoring 54 goals, 44 assists, and 288 penalty minutes. The 31-year-old native of Nesbitt, Manitoba has also spent parts of five seasons in the DEL with Dusseldorfer, Schwenninger, and Iserlohn, totaling 158 games played, 58 goals, 49 assists and 337 penalty minutes. Rome finished last season with the Manchester Monarchs and recorded nine goals in 19 Kelly Cup playoff games helping lead the Monarchs to the Eastern Conference Final. Rome was originally selected by the Boston Bruins in the fourth round of the 2004 NHL Draft, and then again by the San Jose Sharks with the 143rd overall pick in 2006. Community Express (July 5-July 12) Worcester Railers HC Night at the Bravehearts!